The episode starts with Melantha Jhirl finding Captain Eris in the garden, where he tells her it is the only place he can escape his mother, Cynthia. Eris and Jhirl then get together, like in the book, but it makes more sense than in the original novella this show is based on. Interestingly, just as they reach the bedroom and Eris is taking off his shirt, he hears his mother's voice screaming in his head. As viewers, we have no idea why, but this is the moment when something very interesting is happening elsewhere on the ship. We then cut to D’Brannin, just before he sees another vision of his little girl, Skye. He is frozen in shock until Rowan tells him she isn't real, that she’s a hologram and he can just walk through it. It seems all Cynthia can throw at them are malfunctions and holograms, and this realization allows them to get to grips with their environment, learning that it has logic and rules. Unfortunately this comfortable certainty is completely upended just moments later. Defying all logic, they find the White Rabbit probe, impossibly returned and sitting in D’Brannin's room. It is the probe being returned that cause Cynthia to scream in her son’s mind. 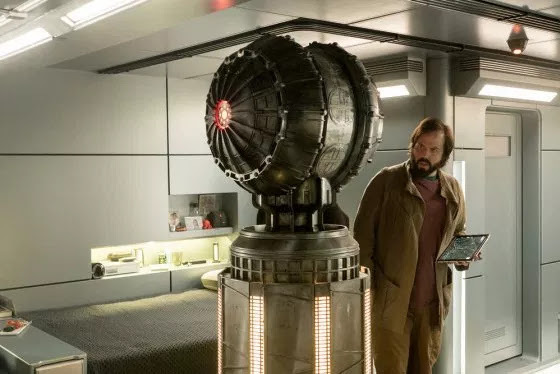 I like the red-eyed probe, especially because Mother wants it off the ship, which means it wasn’t her who brought it onboard in the first place. Eris is keen to get the probe off the Nightflyer, to stop his mother’s screams but D’Brannin and the others refuse to jettison what seems to be an alien artifact. The probe proves full of surprises, as soon Rowan discovers it is bleeding. Some of its circuitry is flesh and blood. He also finds the DNA in the probe’s blood belongs to D’Brannin. Agatha comes a little from the background, featuring in the dreams of her telepath patient, and revealing to D’Brannin that she fell pregnant, years before. She decided not to have the child or tell him about it. She and D’Brannin share a lot of history, and it will be interesting to see what effect that will have on the mission. Somehow, I can’t see them simply getting back together. Lommie plugs into the probe and sees galaxy's, an expression of wonder on her face. Then the mechanical probe starts to bleed and die. She says the probe was sent back in reply, after he sent them a piece of himself. They have returned more of him as a response. The probe is filled with an immense amount of data and has been out there over for over 1000 years. This hints at some advanced technology at the disposal of the aliens, if they can send probes back through time and teleport them into people’s bedrooms. I’m all for a story that features all-powerful aliens acting in ways that we simple humans find difficult to understand. 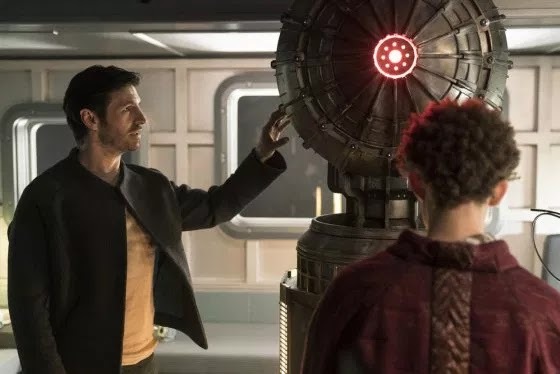 In fact, the lack of alien contact in the original novella was one of its big weaknesses, and I’m glad the TV show is rectifying it. It's a mid season episode, inching us slowly toward the climax, but an effective one. Not an enormous amount happens, and we don't learn a lot of new stuff, but the tension ratchets up nicely, nonetheless. The design of the probe is also excellent, making it a real and imposing presence among the cast. I’m very keen to see where this story goes, and whether it is the alien Volcryn or the ghost of the captain’s mother that causes the crew the most problems.